All my friends are saying that they are going to upgrade their OS to Windows 8, but what is the necessity of it? Can you tell me 5 important reason to go for Windows 8 upgrade? Is it possible to upgrade my Windows 7 32 bit version to Windows 7 64 bit version? Re: Can you tell me what are the five important reason to upgrade older version of Windows to Windows 8? Touch Screen Support - The most obvious change is that the Metro interface has been designed with touch control in mind so that anytime it can be installed and used in touchscreen device such as an all in one PC. In the same time traditional keyboard and mouse input is still supported too so you its like a 2 in 1 OS now where you can upgrade the hardware and experience the real usage of the touch in Windows 8 or use it as normal Windows OS in the PC. Apps - The OS acts more like a mobile when it comes to apps with the Windows store, where you can browse, download and install the apps designed for the Metro interface of Windows 8. There are very few apps as of now like Maps, Photos, Messaging etc. but there will more apps introduced when Windows 8 comes live. Cloud Service - Windows 8 has a cloud focus to it which is very much used in every field now a days. So now in Windows 8 whatever data’s you stored can be accessed from different machine from the cloud. Device and Backward Compatibility - Windows 8 works in every machine flawlessly without any problem let it be 27inch PC 15inch Laptop or 10inch tablet it works fine in all those machines properly. The resolution changes accordingly to the hardware which we are going to use so every process are optimized in that way. Backward compatibility is nothing but it as the apps which it work with and also the same old applications which works in Windows 7 too. Task and File Management - A couple smaller and handy tweaks have been made to the Task Manager and File Manager where is some real - time graph is shown to display the transfer speed. The app which are running will not be closed but goes to sleep state where it automatically closes when the memory cycle pool needs the resource. This ultimately have payed the way for increase in performance and efficiency. So these are some of the important reasons where you can go and check what Windows 8 all about and it’s worth giving a try. Internet Explorer 10 will be included both as a Metro-style app, which will not support plugins or ActiveX components, and a desktop version which will maintain legacy plug-in support. Ability to sign in using a Microsoft account. This will allow for the user's profile and settings to be synchronized over the internet and accessible from other computers running Windows 8, as well as integration with SkyDrive. Windows To Go will allow Windows 8 to boot and run from a bootable USB device (such as a flash drive). Window 8 will come up with lot of new features primarily aimed at increasing speed & easy user interface. Window 8 will support USB 3.0 , which speed of data tranfer will be upto 10 times as that of USB 2.0 which we presently use. including the user's programs, settings, and files. to view all simultaneous file operations in one consolidated window, and can pause file operations in progress. You can now mount ISO, IMG, and VHD files as virtual drives through simple right-clicks, earlier it was not possible in windows 7. The Start button has been removed, but the you can still click in the bottom left corner of the screen to open the Start screen. 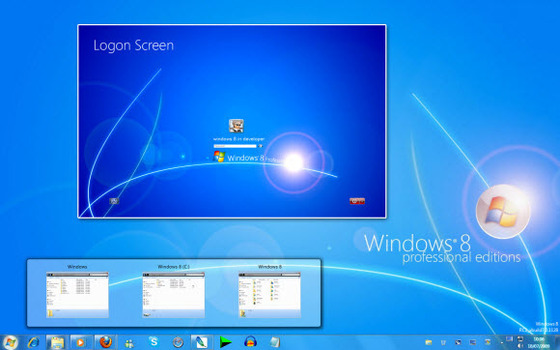 Windows 8 will provide a configurable taskbar in the traditional Windows desktop that spans multiple monitors. Windows 8 will provide new extensively redesigned "Metro-style" user interface, optimized for touchscreens as well as mice and keyboards. You will see new new Login methods , which allows you to choose picture password & then use a set of gestures in the selected picture to login. Windows 8 has short boot times. 1.Windows 8 will provide lightning fast boot time. 5.windows 8 has an built in antivirus present inside the kernel of the operating system. There will not be any particular reasons to upgrade the windows to windows 8 but it is very much efficient with the great features in mind and the reasons may be speed performance of the system,Exciting features,great picture clarity and also it is having additional properties with it so these reasons may be the upgrade of the windows to windows 8.and you can experience it. Friend, it is to be accepted that always latest Version has the good features when compared to the Old Versions. So, in need to use those features you should upgrade to Windows 8. Some apps which are not present in Windows of Older Version is present in Windows 8. In order to make use of these apps you should upgrade to Windows 8. If you want to use the Multi Monitor and experience it you should upgrade to Windows 8. There are still may things why you need to upgrade to Windows 8.
there are many new feature windows 8 operating system provides than the older version of operating systems..
Ans.The new windows 8 comes with a lot of new features. 1. Internet Explorer 10 = window 8 gives u facility of internet explorer 10. 2. 3.0 USB supportable = window 8 is supportable 3.0 USB. 3.speed boot time= This OS speed up boot time. 4. Touch screen facility = window 8 provide you touch screen facility you can install it any time and enjoy it . 5. look and Apps.= window 8 gives your pc a new look and it gives you many more interesting apps. facility also. dear windows 8 is the latest version of the computer windows and if you want to be updated with the latest features of the windows then surely you need to upgrade your version of windows not only this but windows 8 contains features like sky drive ,it contains internet explorer 10 which is better then the previous version,also graphics of windows are quite exciting so because of all the above mentioned features i think you need to upgrade your version of windows to windows 8. INTERNET EXPLORER 10 - It is Fast Fluid with Tons of Applications. APPLICATION BAR - It Organize all your Application in a Snap. SEMANTIC ZOOM - It launches Application when you Just have a Swipe on it. APPLICATION MANAGEMENT & SWITCHING - It Helps you to Switch between Running Applications Avail at Time. CHARMS - It Allows you to Search & Share Many Applications. 1)Windows 8 has built in antivirus. 3)In windows 8 application are closed automatically. 4)Some of the biggest changes include the new Metro UI, Windows Store and the ability to run on ARM-based systems. 5)Windows 8 has a New Task Manager. Touch support- Microsoft introduces touch support to windows 8. If your computer has touch property then you can control your system only by the touch. Price- If you go for upgradation of windows then you have to pay some money-which is less than the money needed for buying a full version of it. Windows store- Microsoft introduced a new online store (Like Apple's App store) for windows 8 from which you can purchase/free download many applications. Recover files- If there is any file, you've modified & overwritten then you can recover the original file in windows 8. Processor- if you have x86 or ARM processor you can RUN windows 8 in any of these two system-you don't have to change your hardware system. Modern UI- You can avoid modern UI in windows 8. New feature- Windows 8 introduces new refresh & reset features. So you can feel the better experience to work with it. Cloud- You can synchronize your PC to cloud services with your Microsoft account using windows 8 easily. File handlers- You can so some jobs in windows 8 using the appstore. You don't have to install third party software for that. File transfer- this feature is windows 8 is relatively good comparing to other OS. Also you can see all the details during any file transfer. Microsoft has recently released Windows 8, the newer version of Windows OS. Windows 8 has many new features in comparison to Windows 7. Windows 8 has Metro Screen which makes it user friendly to access smoothly. Windows 8 can be easily accessed in Tablet PC. Actually, Microsoft has designed it to reduced the difference between Tablet and PC. Faster Boot Feature - Windows 8 opens much faster than Windows 7. Much Advanced Task Manager - Task Manager in Windows 8 is much advanced and with new functions. 1. The latest- most advanced-cross platform Operating System. 2. Built to be Safer than the conventional Windows. 4. Touch sensitive interactive OS. 5. Till date more than 13000 apps available to do a lot of things. 1) FASTER BOOT UP:- Dear window 8 takes less time to start up and shut down its start up is not time consuming. 2) NEW FEATURES:- Dear window 8 includes many new software features like internet explorer 10 ,ribbon toolbar etc. 3) USB 3.0:- Dear window 8 will support this utility to have high USB transfer and receiving rate. 4). HIGH PROCESSING SPEED:- Dear window 8 has very high processing speed then all other operating systems. 5). TOUCH SUPPORT:-Dear window 8 supports the touch property you can operate your computer by only touching. SO DEAR THAT IS WHY YOU HAVE TO UPGRADE YOUR COMPUTER TO WINDOW 8. It's the cheapest upgrade in the history of Windows. Microsoft is offering Windows 8 for the surprisingly low price of just $40 -- at least for the next few months. Even if you don't have any immediate plans to upgrade, at that price, it might make sense to grab a copy now and just put it on the shelf for a few months until you're ready to experiment. Sync with the cloud. Windows 8 finally embraces online storage and online synchronization, and it does this in both big and little ways. You might already know that Microsoft's SkyDrive service is now baked into both Office and the Windows file system, so you can save and open online files from pretty much anywhere. But what might be less obvious is that your overall PC settings are synced to the cloud as well. That means if you have more than one computer running Windows 8, they can all share the same personalization settings, so you only need to configure one PC and all the others will fall in line automatically. File History lets your open previous versions. Recent editions of Windows have had a little-known feature called Previous Versions, which (on a good day) let you recover older versions of files in case you needed to "roll back" to something you did a week or a month ago. It was well hidden and difficult to use. But Windows 8 has built on the foundation of Previous Versions to give you File History, and it promises to make it much easier to recover older versions of files. There's an app store. You might not think this is an especially big deal, but it is. Microsoft doesn't talk about this much, but the Windows ecosystem -- the community of developers writing and releasing new software -- is in decline. Windows might still be the biggest OS on the planet, but developers are abandoning it in droves to release apps for sexier platforms like iOS and Android. By supporting developers with a store, Microsoft hopes to reinvigorate the platform and bring fresh, exciting new software to Windows. Without a store, Windows best days might well be behind it. And that means Windows 7 software will continue to get less and less varied and interesting. One paradigm for all your devices. This has been an off-again, on-again strategy for Microsoft since the 1990s, but imagine for a moment how simple life would be if all of your computing devices -- from PC all the way down to your tablet and phone -- worked pretty much the same way, and even shared settings and personality. That's what Windows 8 offers -- assuming you like the experience of using the OS to begin with, you can transition from Windows 8 on the desktop to Windows 8 on a Surface tablet to Windows Phone 8 -- even the Windows 8-like interface on the Xbox home entertainment system.